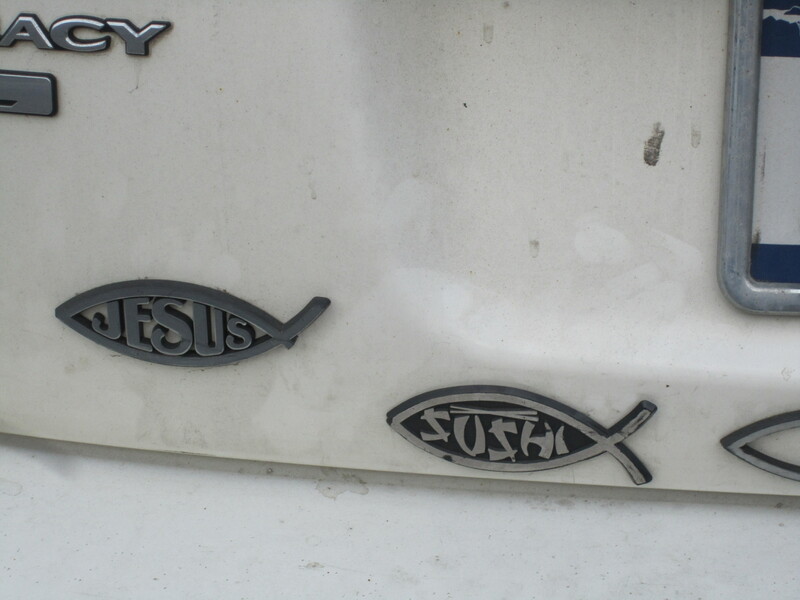 What do Jesus and Sushi Have in Common? Tough question, right? I am sure you are squinting at the details of the back of this car trying to find the answer. Disclaimer, no religious disrespect intended, I am just a lover of parody. Classic Jesus fish, or Ichthys. Not so classic Sushi fish. The ever popular Vegan fish. 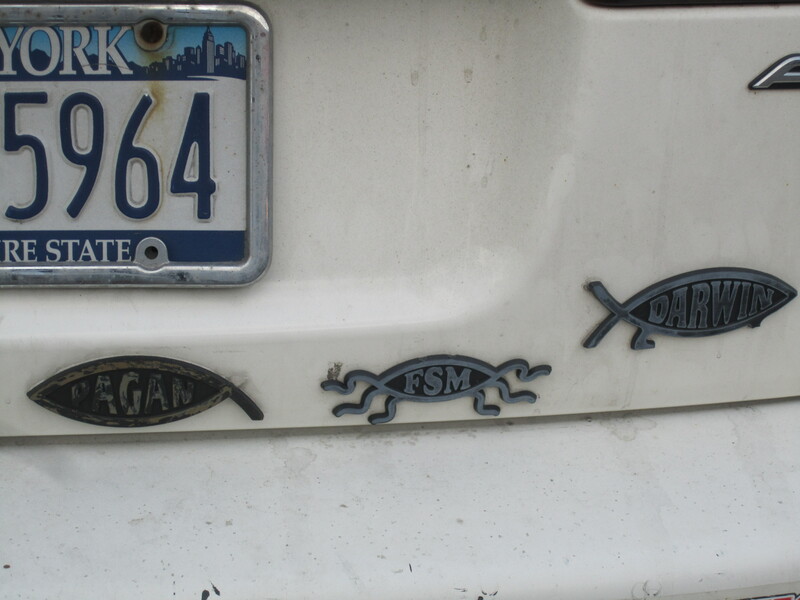 The FSM fish (I will get back to that one) and the completely irreverent Theory of Evolution Darwin fish. In the center was simply an empty fish. I think that one was trying to stand out. Or perhaps it was the void of religion in contrast to the other parody of religion types. Nonetheless they all clung proudly to the back of the trusty Legacy. I had to do a little Googling on FSM and here is what I found. This stands for Flying Spaghetti Monster. Here is what Wikipedia served up for me on this. 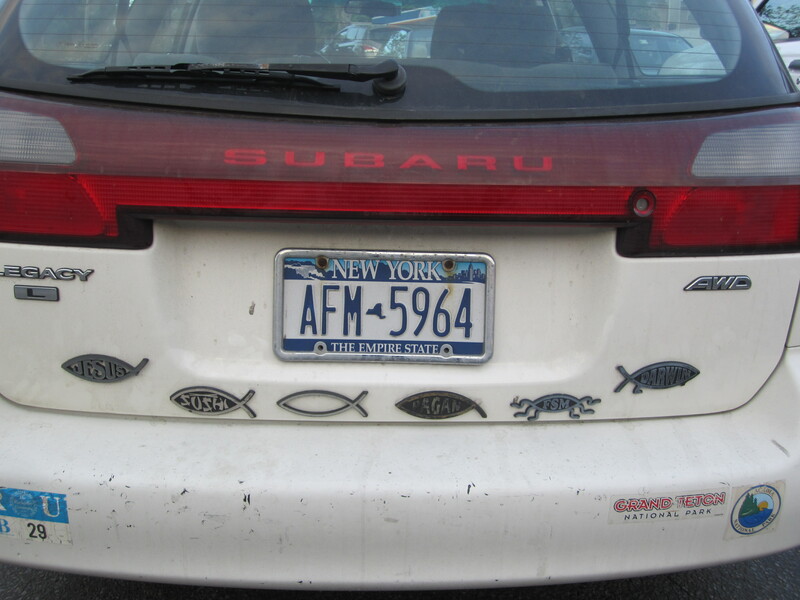 In closing, all I can say is this whole thing only cements the idea that I MUST meet the person who drives this car. I am so glad I got to witness this, if only second-hand. I know it’s gonna come up in conversation sometime soon . . . Happy to share. I MUST find the owner of this car. I am pretty sure they live in the zip code. flabbergasted … how do these things find you? Wow, kim. I am keeping some really funny company. How did we get through life not knowing about this? I believe the camo fish (leaf) actually says ‘Pagan’, not Vegan xD Either way, this guy or gal is hilarious. Hahaha, i believe you are correct.